Lorelei with companions, Seanne and Millisine, has traveled a long way to walk these scarred shores. Now separated by the horrific oily mess that only humans could have caused, the three sirens must struggle to stay alive as they attempt to navigate this strange new world. They must reunite and begin the “Earthquest” that is their reason for being on land. Their underwater home is sick, dying off at an alarming rate. And whatever is causing the near extinction of the last remaining mermaid colony, clearly originated from exactly where they find themselves. Edward Titan had waited decades for this moment. All three have arrived, hopeful and innocent, completely unsuspecting. Soon the ocean’s strongest, smartest and most intuitive sirens will find themselves up against years of festering anger and hatred. Titan’s retribution will be swift and brutal. And it will mean the end of an entire civilization. The Sirens’ Song will soon be no more. 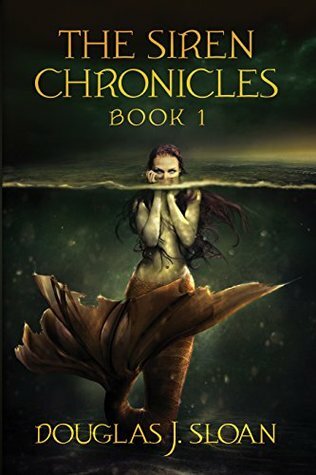 So this book is about three mermaids (Millisine, Seanne, and Lorelei) who have vastly different interests and skills and who have been chosen to undertake a quest that makes them leave their underwater haven and enter the world of the walking. Of course, as soon as they get near the shore they are contaminated by an oil spill and separated. They all wake up to different situations where they individually meet new potential allies and try to find their way back to each other. The cover of this book is gorgeous and the synopsis of this book made me excited to read it.So Sloan did his work on looking up the facts for these mythical creatures, for which I will give him praise for. The underwater city these mermaids and Mermen hailed from came to life with Sloan's writing. It shows how much he learned about Merpeople and what skills and abilities they have. Unfortunately, that is where all the positivity I have for this book ends. I understand that these are beautiful mythical creatures but you don't have to constantly reiterate this whenever they are looked upon. I get it, they are pretty much perfect compared to human standards I don't need it shoved in my face, thank you very much. This also made it extremely hard to connect with any of the mermaids causing me to be very apathetic to their quest and situations. Plus, I really hated Seanne. Every time she spoke, did something or was even mentioned it had me gritting my teeth and rolling my eyes. It took a lot for me to not DNF this book. I know that upon learning her backstory you were probably supposed to become sympathetic to her but it did nothing for me because she kept acting so irrational and stupid that I just couldn't find it in me to like anything that had to do with her. The other two mermaids just let it happen, because this is how Seanne is and it's easier to just go along with it than to get her angry. It was her freaking fault they got split up in the first place too. The story was also kinda boring, and while it did get a bit interesting at the end, you still have to get through 3/4 of the story for anything to really happen. I also wished Sloan was a bit more secretive when it came to the bad guy, I would have liked it to have been somewhat of a surprise rather than pointing it out whenever there was any interaction with him. Overall, not my cup of tea as I was disappointed.